The Shreveport Times reported a potential conflict between coal and gas producers in DeSoto and Red River Parishes. While Louisiana is not widely known for its coal production, it does produce some lignite coal. 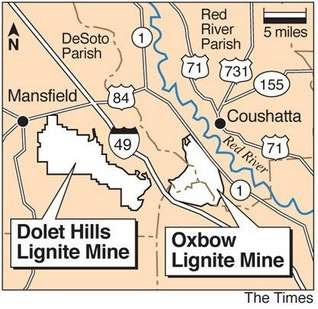 Two mines in North Louisiana, Oxbow and Dolet Hills produce lignite coal for the Dolet Hills Power Station east of Mansfield. They happen to overlay a portion of the Haynesville Shale where EOG Resources has petitioned to create 49 drilling units in the Trenton and Ten Mile Bayou Fields. If drilling occurs at some of EOG's planned well sites, certain unmined sections of the coal prospect that overlay the shale will become isolated and inaccessible for mining. The Louisiana Office of Conservation heard arguments over the conflict because it oversees all mining in the state. The Commission will have final judgement over the conflict, but Commissioner Jim Welsh sent the parties away to try to reach a reasonable solution.